– Let’s hear from Driver 42, out to Chip Ganassi racing and Alan Cavanna. – Adam, a little vacation, a little family time for Kyle Larson during the off week. I know you like to race though, so do you like this off week? Six races into the season? – Um, typically I don’t take any off weekends. But, you know, we’ve got a new baby coming and all that. So I figured I’d spend as much time at home as I could, and I actually enjoyed it. Caitlin’s family came out, so we spent Easter at home. And it was a lot of fun, relaxing. But I’m ready– ready to get back in a race car. – Yeah, and we are headed to Texas. Six races into the season, do you give yourself a grade? Do you give your team a grade? What are you looking to improve on? – I feel like speed wise, we’re kind of close to where we were this point at last year. You have a couple of spots worse. I had really good finishes last year. But, you know, a few of those second place finishes that I had to start the year. I didn’t run in the top two all race long. We had good pit stops and good restarts, and right now– you know, rather than gaining a couple of spots at the end– we’re losing a couple at the end. So we’re just– you know we’re right there, I think we’re close. But the four and the 78 are kind of, really fast. – It surprises me every time I think about it. You don’t have a win at a mile and a half race track. If you have a weakness, or if there is a weakness, what do you think it is? – Last week, or Martinsville, would be our weakness. – But at the mile and a halfs, is there a struggle? It just surprises me. – Yeah, I don’t know. You know, mile and a half’s, I feel like, our strongest tracks. Yeah, I’ve won a lot at Michigan, and in Fontana. You know they’re two mile tracks, but really it’s just like a mile and a half. So I don’t view it as, I don’t have any intermediate wins. Or anything like that. So yeah, I don’t know. I don’t know why, but someday we’ll get a lot of them. – Yeah, Adam maybe someday will be this weekend at Texas. He’s a second, a third place this season. Looking for that first win. – Yeah, and Alan that third place finish came on a mile and a half at Las Vegas Motor Speedway. They were talking there about the difference between a mile and a half, and a two mile track. What is it Jeff? – OK, that was a trick question. I was hoping you wouldn’t answer that way, because I was going to hammer you on what the difference was. But Bobby mindset wise, do you think of those two as different? A mile and a half or two mile, or are they just lumped in together as an intermediate? – I think they’re lumped together. I never looked at it as a two mile being distinctively different than a mile and a half. I think all tracks are different. You know, they might look the same way from a GPS point of view, in Charlotte and in Texas. But at the same time, they all drive differently. And I don’t think those speedways or big tracks are any different. I won my first race at Charlotte, mile and a half. Two, weeks later won at Michigan, two. It didn’t feel any different. It’s the same type of speed, the same type of feel. 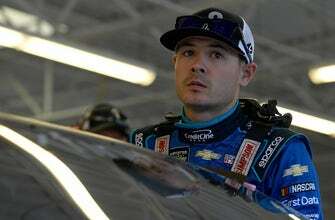 – And we might not be having this conversation– about, when’s Kyle Larson going to win on a mile and a half– if not for Truex and Bush being out front of him at Miami. When you felt like he just laid back, and let them fight it out for the title. You look at the start for the 42, Jeff. The best Chevrolet as far as points are concerned. When we get to the end of 2018, will we in fact say, the best Chevy this season was that 42 Group? – At this point in time, I’d say yes. I mean, he’s the only one that’s really shown some consistent speed throughout the entire races. They still are hitting– hit and miss, but he’s been the best so far. So once they get a grip on this, this young man has got so much talent. And he can drive a car that’s not exactly right, better, I think, than anybody else. That I know of, you know, at this moment. So yes, I think that will be the case. Don’t you think so, Bob? – He’s definitely carrying the Bow-tie Flag right now. Because the Hendrick Motorsports guys, they are getting a little bit better. But still, Kyle came out of the box really faster this year, than the rest of them. So definitely there, they have some catching up to do. And Kyle adapts to racetracks. I think, again, hints that he goes to all the different racetracks and runs them. Mile and a halfs, two miles, and wins with those. At the top of the racetrack. – One thing, real quick. You talk about drivers minds, just remember. You can put whatever you need to in them, and they’ll believe it.